The difference between fall arrest and fall restraint may sound like little more than a technicality, but the reality is so much more. Selecting one of these systems will leave long-lasting legacies for the worker, the OHS professional and even their accountant. The hierarchy of controls for safe work at height is different to the everyday hierarchy used for other hazards. Uniquely, it mandates the process for selecting the most appropriate means of eliminating hazards on site. While it has all the colour and excitement befitting its legislative status, the falls hierarchy is well worth reading because it subtly takes into account the real-life human factors and cost considerations that matter. While the hierarchy of control is to be applied to work practices using temporary and permanent equipment and procedures, this article deals primarily with permanent fall prevention equipment like anchorage points, static lines, platforms, walkways and catwalks. Work from the ground or from a solid construction such as a platform. Use passive fall prevention equipment, like guard railing or scaffolds. Use fall restraint/work positioning equipment, such as anchors or static lines with harness. The layout of the system is configured so that the worker can’t get to a fall edge, and therefore can’t fall. This level includes all of the procedural and training requirements so that the work is done safely. Use a fall arrest system, so that if a worker falls their fall will be arrested before they hit the ground below. This typically encompasses the anchors and static lines under level 3, but includes rescue plans, rescue equipment, and specially trained rescue operatives. If none of the level 1 to 4 controls can be implemented, then the last resort is to work from ladders or to use administrative controls and procedures. Before moving to a lower level control, the higher control measure must be eliminated on the basis that it is not practical to implement from an engineering point of view, such as space constraints. As the height element renders this equipment potentially lifesaving, cost considerations take a lower priority. The following example shows how to use the hierarchy. 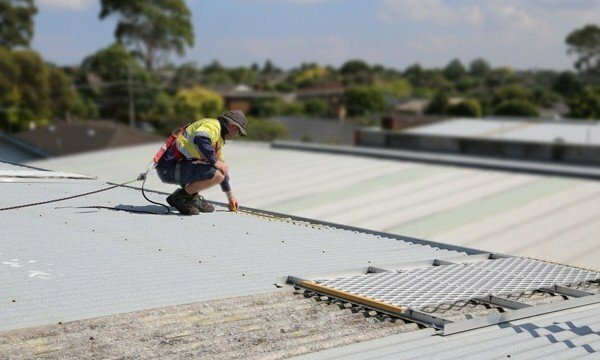 Many roofs have a cooling tower that requires routine monthly servicing to control the spread of legionnaires disease and to meet the mandatory inspection requirements. Consider where the access panels and motors are located and whether these can be relocated to ground level. This is unlikely to be achievable, since entry points and motors are typically on the top of the units. Assess whether a level platform and perimeter guardrail can be built around the unit, together with a staircase or ladder access to the working surface. You may find that neither can be achieved since the cooling tower is located on the edge of a building with limited structural capability to support a platform. Determine whether a scaffold can be erected for monthly servicing or whether guard railing (permanent or temporary) can be installed at the fall edge. This may not be feasible if the fibreglass structure cannot sustain the fall loads against the guard railing. Decide whether a fall restraint system (or ‘work positioning’) can be used, where workers wear harnesses attached to anchorage devices located so they simply cannot get to a fall edge. The risk of falling must be completely eliminated through the layout and positioning of the anchorage device and complemented with rope systems that keep them from the edge. The user also needs specialised training and equipment. A work positioning system may not be possible, since there may not be structural attachment points to designate for the 15kN, one user anchor, or anchor points in locations that accommodate an anchor configuration where the worker can’t fall. Consider whether a fall arrest system can be installed. A fall arrest system accepts that the worker may fall and be injured, but limits the likelihood of a fatality. This requires a system that can handle two people, including enough anchors rated to 15kN for one user and 22kN type anchors rated for two users. Ancillary rescue equipment, rescue plans and rescue personnel need to be in place while the work is being carried out so a worker who falls can be quickly rescued, treated and transported to hospital. Other considerations when working with level 4 are the fall distances, pendulum swings and suspension trauma, as discussed in the following sections. Ladders and administrative procedures are only used when other options are exhausted. They could involve workers standing on ladders, complemented by procedures, paperwork and instruction to reduce the risk of falling. Ladders are the most common cause of fatal workplace falls from height. On the surface, fall arrest and fall restraint look very similar as they both involve harnesses and roof anchors, but the outcomes can be terribly different. The layout of a system and the positioning of the anchor points or static line determines whether a system can be used to restrain the user or whether the person can fall. Also consider the access to the system and whether the worker can fall while trying to get to it. A good example is an industrial rope access system where workers must climb over a balustrade. Their ropes may be limp while they are climbing over the balustrade and they will hit the side of the building if they fall and have their fall arrested, say, two metres below. 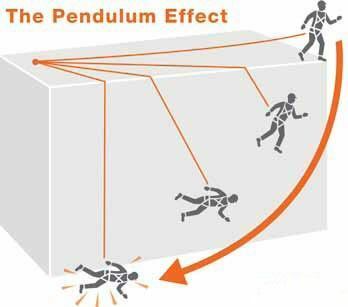 If a system is not correctly laid out or is incorrectly used, a person could swing like a pendulum in the event of a fall and slam into the side of the building – see below. Always verify that the layout is capable of being used in fall restraint. Since there aren’t any formal qualifications, ask for specific evidence of the layout designer’s training, as well as evidence they have been doing layout work under the supervision of an experienced operative for several years. A worker in a harness working off a static safety line or from anchorage points has a shock absorber between their harness and attachment point to reduce the shock on their body from a fall. 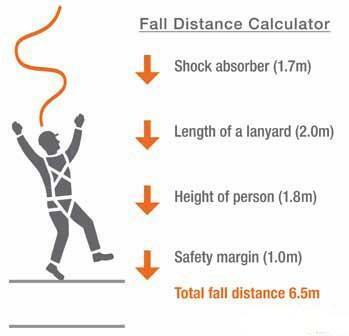 A typical fall clearance calculation means adding together the person’s height (say 1.8m), the length of the shock absorber at extension (1.7m), the lanyard’s length (say 2m) and a safety clearance factor (say 1m). In this example, and as shown in Figure 2, the worker falls a total of 6.5m before the harness is effective. When considering the location of static lines and anchorage points, it is essential to consider what is below the fall area. Falling over six metres from a two storey building as in the previous example means the worker will hit the ground – despite being fully kitted out with a harness. The design of the anchor system and static line need to be considered. The rope on a static line flexes depending on the number of interim anchorage points, the overall length of the line, the performance limitations of the shock absorber, and the extent to which the line has been tensioned up, inspected and maintained. If a person is a metre from the edge, for example, but the design allows for 1.2m metres of rope flex, then this would be designated as a fall arrest static line, meaning that a person could fall off the edge. Aside from fall clearances, the possibility of suspension trauma death caused by orthostatic incompetence is real, as explained by Drs Bill Wheems and Phillip Bishop of the University of Alabama in their paper: Will Your Safety Harness Kill You? Drs Wheems and Bishop detail orthostatic incompetence, which occurs when a worker is suspended upright for more than five minutes with their legs immobile beneath them. If left in this position blood then pools in the legs, reducing the flow of blood to the heart and causing heart failure. 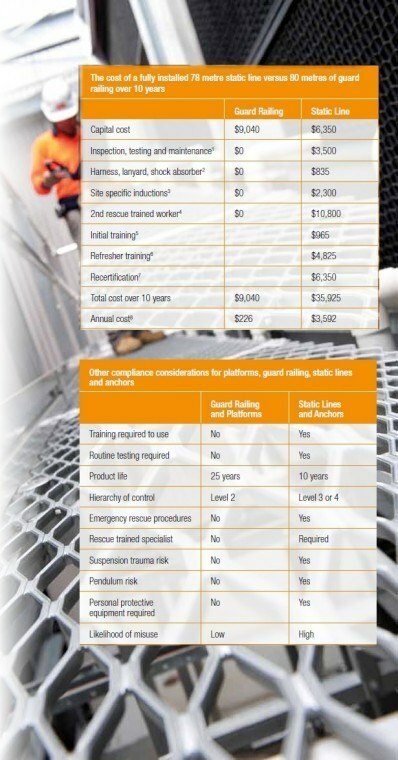 To determine a true lifetime cost of any control measure, the OHS practitioner needs to take all the mandatory requirements related to equipment compliance into account rather than simply the upfront capital cost of an anchor, harnesses and rescue equipment. Longer service times while working in harnesses, contributing to increased compliance costs related to developing safe work method statements, job safety analysis or specific work procedures every time the job starts. Of course, there is the likelihood that one or more of these are not done properly. It is human nature to want to get on with the job. Unfortunately, short- circuiting the process renders the system ineffective. Lifetime cost analysis means taking all of the operational costs into consideration over, say, a 10-year period and working out the true cost of a typical system. An example of a 10-year lifetime cost analysis of a static line compared to guard railing is included in the tables opposite. Of course every site is different and different organisations are better geared up for harness based work, so the items in the chart may vary from site to site. The bottom line is that a static line or anchor point system can cost between 10 and 15 times more than higher order control systems. An annual inspection, re-tensioning the line. Replacing the kit after 10 years, and reasonable wear and tear replacement. Inducting workers four times a year for 30 minutes each by the site supervisor. Two hours per quarterly service. One operator only, including eight hours off work. Refresher training for one person only every two years, including time off work. Replacement of shock absorber, cable, end fittings and structural assessment after 10 years. Depreciating guardrailing at 2.5% a year, based on the ATO (Australian Tax Office) allowance, with static lines over 10 years, given that most costs are operational and a major rework of leading products in the tenth year. The hierarchical legislation fits very neatly into a framework that resonates with financial officers. These people are involved in the procurement decisions, so accounting and differentiating between capital outlays, operational expenses and depreciation allowances will often steer the organisation into higher order controls.